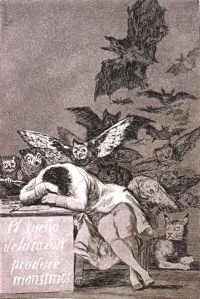 Caprichos is a set of 80 aquatint prints created by the Spanish master-painter Francisco Goya during the 1790s; among the most famous prints is "The Sleep of Reason Produces Monsters". 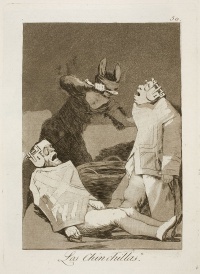 The prints were Goya's artistic experiment: a medium for his condemnation of the universal follies and foolishness in the Spanish society in which he lived. The criticisms are far-ranging and acid; he speaks against the predominance of superstition, the ignorance and inabilities of the various members of the ruling class, pedagogical short-comings, marital mistakes, and the decline of rationality - among other things. Goya described the series as depicting "the innumerable foibles and follies to be found in any civilized society, and from the common prejudices and deceitful practices which custom, ignorance, or self-interest have made usual". The work was an enlightened, visual tour-de-force critique of 18th century Spain, and humanity in general. 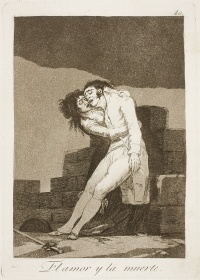 The informal style, as well as the depiction of contemporary society found in Caprichos, makes them – and Goya himself – a precursor to the modernist movement almost a century later. Caprichos were withdrawn from public sale before their planned release in 1799. Only a formal order from King Carlos IV kept Goya from being called before the Spanish Inquisition. Francisco Goya was considered skilled but unremarkable until he contracted lead poisoning in his late forties and made Caprichos. 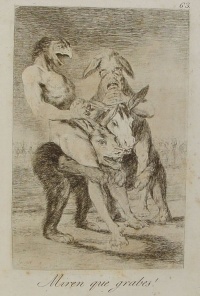 Goya's series, and the last group of prints in his series The Disasters of War, which he called "caprichos enfáticos" ("emphatic caprices"), are far from the spirit of light-hearted fantasy the term "caprice" usually suggests in art. Capricho nº 8: ¡Que se la llevaron! Capricho nº 14: ¡Qué sacrificio! Capricho nº 21: ¡Cual la descañonan! Capricho nº 27: ¿Quién más rendido? Capricho nº 30: ¿Por qué esconderlos? Capricho nº 37: ¿Si sabra más el discípulo? Capricho nº 40: ¿De qué mal morirá? Capricho nº 52: ¡Lo que puede un sastre! Capricho nº 53: ¡Que pico de oro! Capricho nº 59: ¡Y aún no se van! Capricho nº 62: ¡Quién lo creyera! Capricho nº 63: ¡Miren que graves! Capricho nº 65: ¿Dónde va mamá? Capricho nº 75: ¿No hay quién nos desate? Unless indicated otherwise, the text in this article is either based on Wikipedia article "Caprichos" or another language Wikipedia page thereof used under the terms of the GNU Free Documentation License; or on original research by Jahsonic and friends. See Art and Popular Culture's copyright notice. This page was last modified 07:33, 20 May 2014.